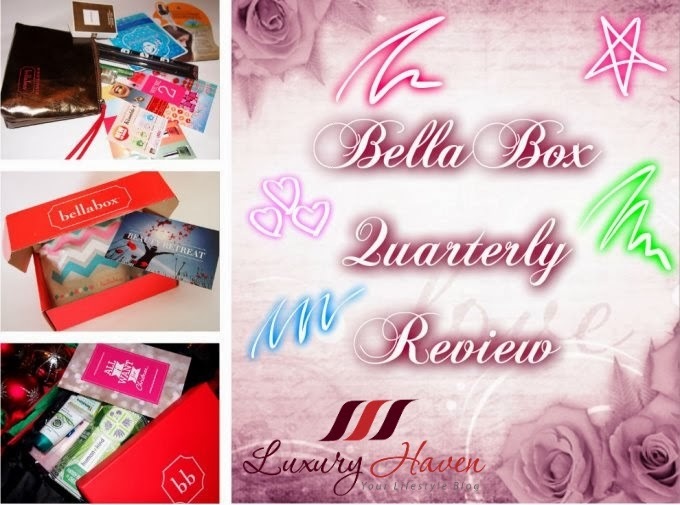 You are here:Home » Promotion / Events » BellaBox 4th Quarter Beauty Review Is Out! A sensual floral scent that is refined, mysterious, luxurious and vibrant. 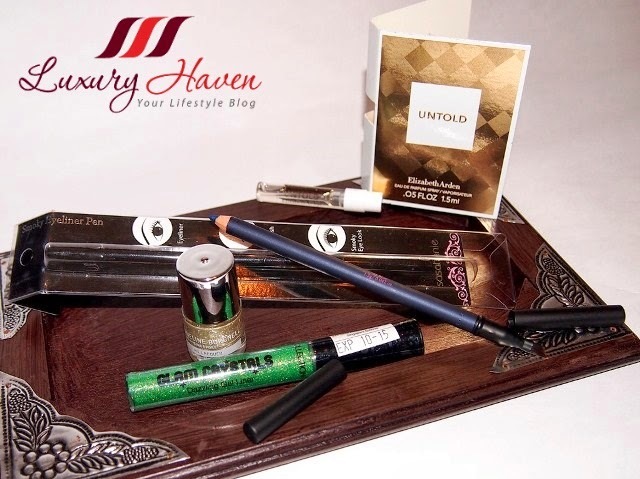 Read more at Elizabeth Arden UNTOLD Story! Create the signature smokey eye look with this non-greasy and long-lasting eyeliner formulation by using the accompanying brush on the other end. Simply blend for a smokey eye effect. Born and bred in Singapore, Jacqueline Burchell’s Nail Lacquer ranges from glittery golds to solid pinks to shimmery silvers. Quick-dry formula with high shine or matte finish; over 300 colours to choose from! Lucky me, I got a gold colour, perfect for X’mas! Wear over eye shadow or alone with mascara. 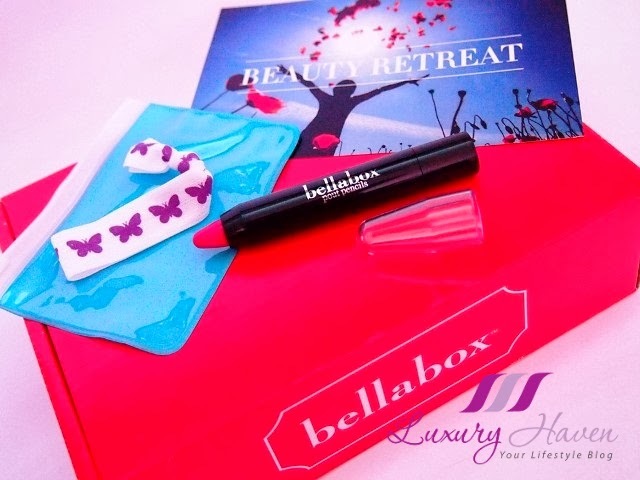 The October Anniversary Bellabox also came with a copy of the #Cosmopolitan Magazine, and a box of #Whisper Cosmo Day and Night @ SGD 7.90. 3x more absorbency compared to normal pads, even when upside down. No more leakage, stay dry and comfy! 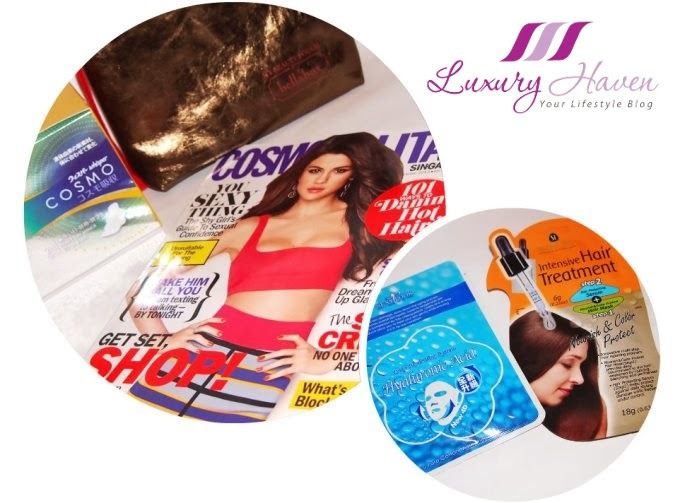 Containing Nourish and Color Protect Hair Mask (Step 1) and Hair Protecting Serum (Step 2), this is an innovative multi-step hair repairing program that combines the benefits of hair mask and hair serum for maximum treatment results. Available in 7 vibrant and intense colours, this is a ultra-multipurpose cosmetics for face and body. 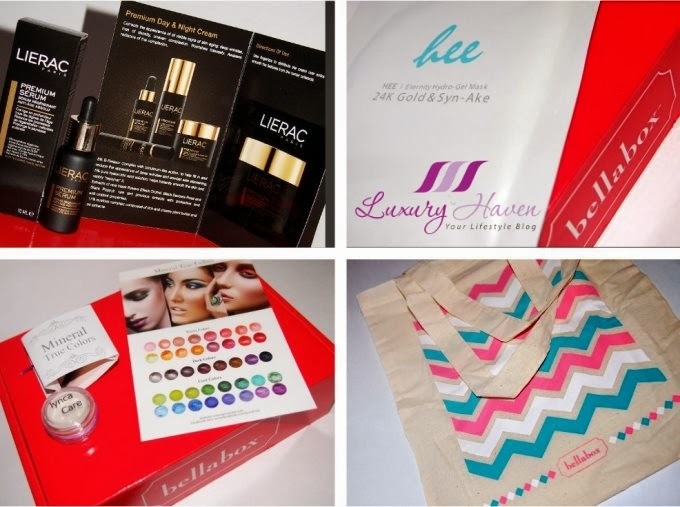 All the goodies in the November BellaBox were stored inside a limited edition Beauty Retreat bella-tote! Pretty, isn’t it? Its highly pigmented crayon is drenched with Vitamin E and Beeswax, perfected for a long lasting and hydrating sugar lips. 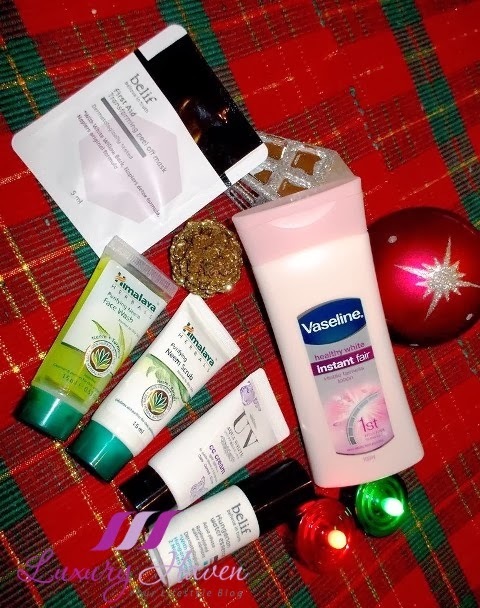 December ‘All I Want For Christmas’ BellaBox has 8 items including 4 full-size ones! Just one slap of this lightweight lotion and its skin micro-reflectors work to diffuse and reflect light to give you instantly fairer skin as and when you desire! Not only that, this high absorbent lotion is enhanced with Vitamin B3, 12-HSA and UV protection to condition, lighten and even out your skin tone. These Monsters Look nail wraps gives you instant manicure in just 15 minutes; no heating lamp nor drying time required! This kit consists of one sheet of 20 premium quality nail wraps, a mini nail file, and a step-by-step instruction. A newer and improved version of the Modelco Fat Lash Mascara, this ultra volumising and lengthening mascara contains a smudge proof formula that is non-drying and buildable for fuller and plumper lashes. Its bomber shaped brush at its tip allows you to apply the mascara vertically, making sure that every lash is conquered - even the difficult ones near your tear ducts and lower lash line. All-in-one remedy cream that calms and alleviates problem skin. From eczema, psoriasis, acne-prone skin, sunburn to insect bites and stings, wounds and cuts, cold and bed sores, brittle nails and athlete’s foot, one squeeze from this winner of the Tatler Beauty Awards 2012/2013 is the perfect medicine for the skin! After this beauty tour, do you have a better idea on what to add to your shopping list? BellaBox is currently throwing a Christmas Blowout Sale at up to 60% off! Be sure to catch them before they’re gone! Reana, I'm in a shopping mood too! Gosh, too many stuff in the list!! Great offer and beautiful items. Kathy, full-size bottle? They'll go broke in no time as BellaBoxes is only going at around $20, & EA frangrance is about $100. Lol! 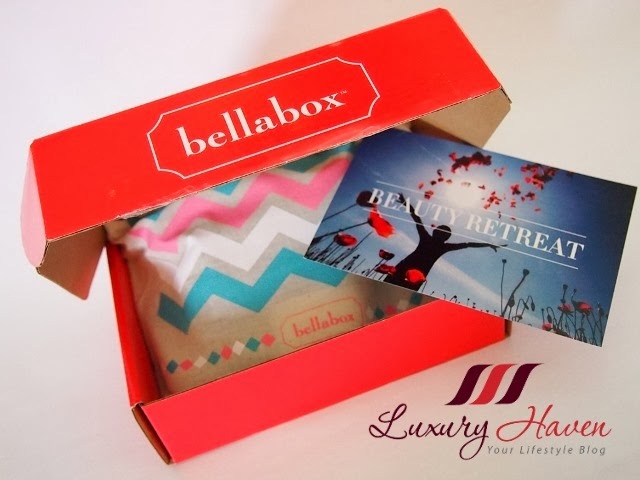 The October to December bellabox is full of goodies! I've tried the whisper cosmo sanitary pad - it's indeed super absorbent and keeps you fresh whole day through. DS, thanks for sharing your thoughts! Happy weekend! Sharon, nail wraps make great gifts! Milex, thanks for coming by & love having you here! Louise, thanks dear! Glad you've enjoyed the tour. Rose, indeed! We need to take good care of our skin & looks, isn't it?? Kylie, some of the boxes are real tempting! Nava, hahaha! Glad this caught your attention! Pepper, hope you'd a great time shopping! nice products share and 60% discount? Xinyun, did you managed to catch their sale? 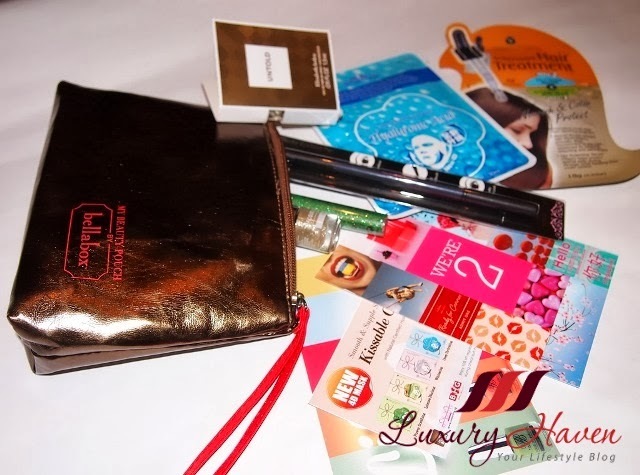 That is one nice beauty box, wish they will bring out nice beauty box like this here. Subha, hope they'll hit your shore soon! Zoe, I've a black belt in shopping! Hahaha!